This post has been sponsored by MARS, Inc. All thoughts and opinions are my own. 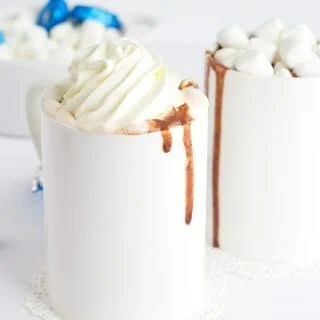 Thick and creamy slow cooker hot chocolate is perfect for a laid back day. It’s quick to throw together and you can just let it go for four hours until extra creamy. Whether you prefer milk chocolate or semi-sweet, you can customize this to your liking! I’m all about this slow cooker. I’ve been testing desserts in it for the last month and now I’ve started with drinks. What I love most about it is that you can toss in your ingredients and the rest is history. It does all of the work while you’re off helping the kid(s) with homework or whatever it is that you have to do. 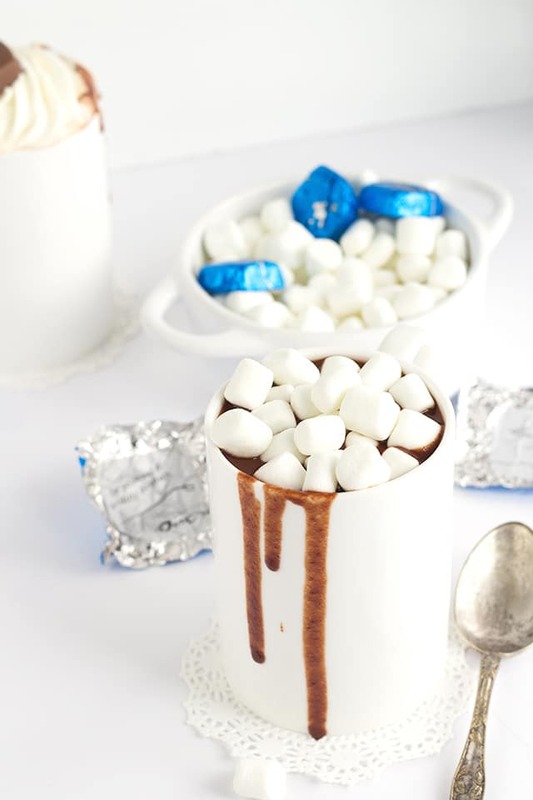 My milk chocolate slow cooker hot chocolate was inspired by one of my favorite chocolates. 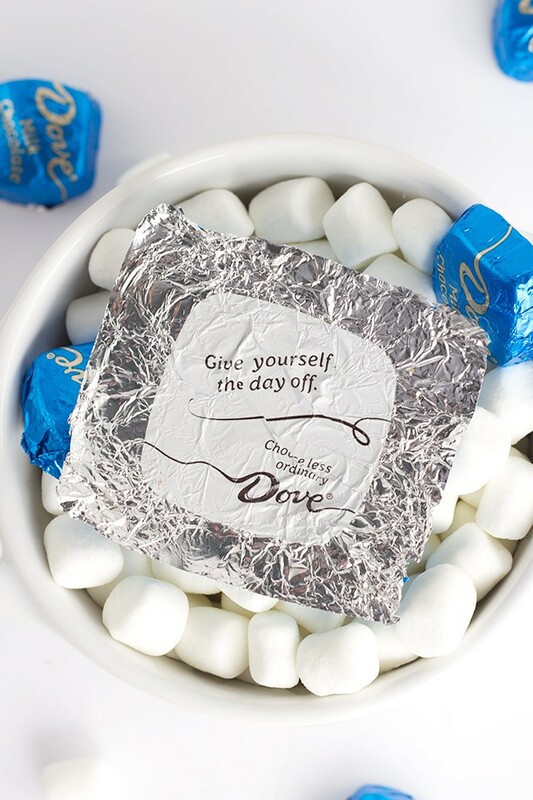 I remember having my first DOVE® Promises®. I was in college and my roommate had them displayed on her desk. Don’t tell her, but I would sneak one every now and then. They were calling my name! Now I buy my own from the ginormous selection that they have at my Walgreens. I go for the makeup and end up with an arm full of DOVE®. 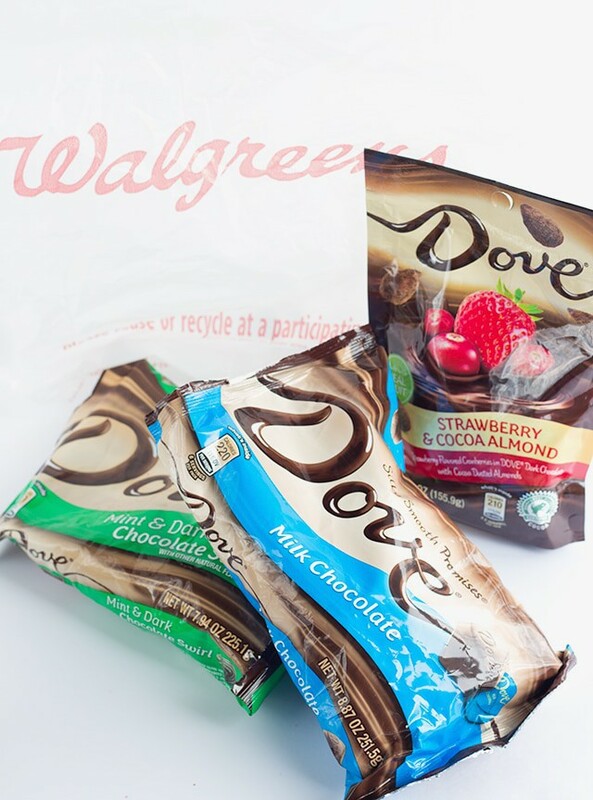 Stop into your local Walgreens between 4/30-6/4 to save $1 when you buy two DOVE Promises! Does anyone else love to read the insides of these chocolate wrappers? They’re always so inspiring. This wrapper is the perfect reminder for me. I feel like I never remember to take a day off and unwind. I deserve it for sure, but when you’re working from home it’s easy to continue to work well into the late hours of the night and on the weekends. 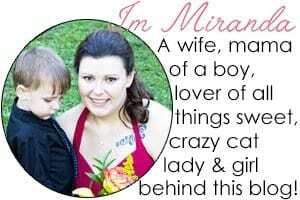 My husband is pretty awesome though. 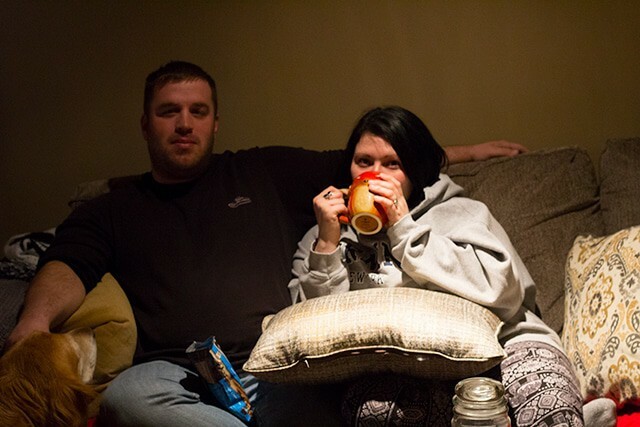 He reminds me to settle in, relax, and just enjoy a movie night with him after our son has gone to bed. So we do. 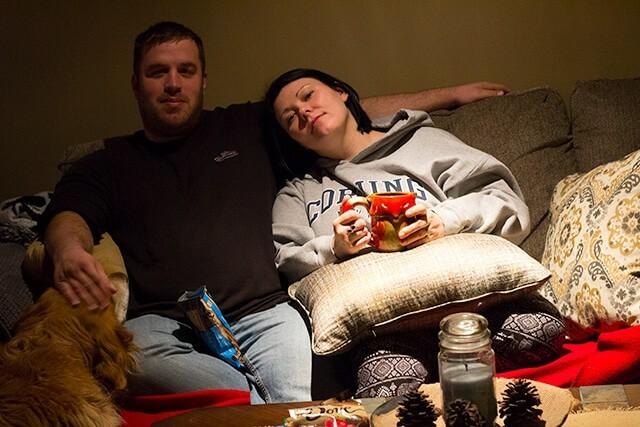 We grab our drinks, DOVE® chocolates, and put on a movie or maybe a series that we’re behind on and treat ourselves to some alone time. I like to go big when I’m taking the night off so I put on my leggings and a big hoodie. That’s full on relax mode for me. 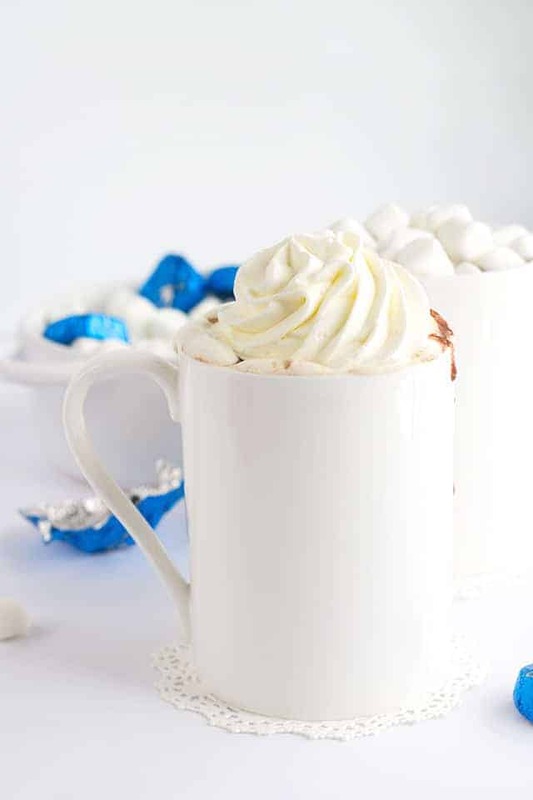 I couldn’t decide what I wanted to top my hot chocolate with, so I did both mini marshmallows and homemade whipped cream. We’re going big, right? Plus, I’m really indecisive. 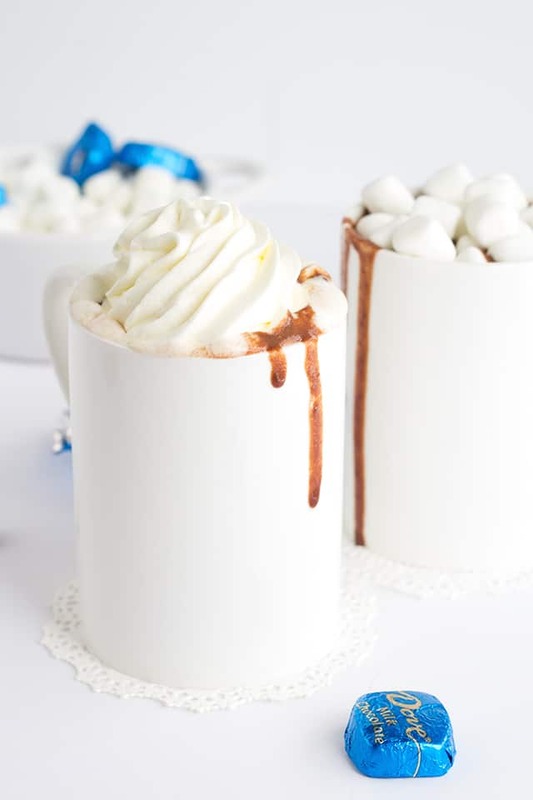 I just can’t get over how creamy this hot chocolate turned out. It’s the kind that coats your mouth with sweet chocolate flavor. 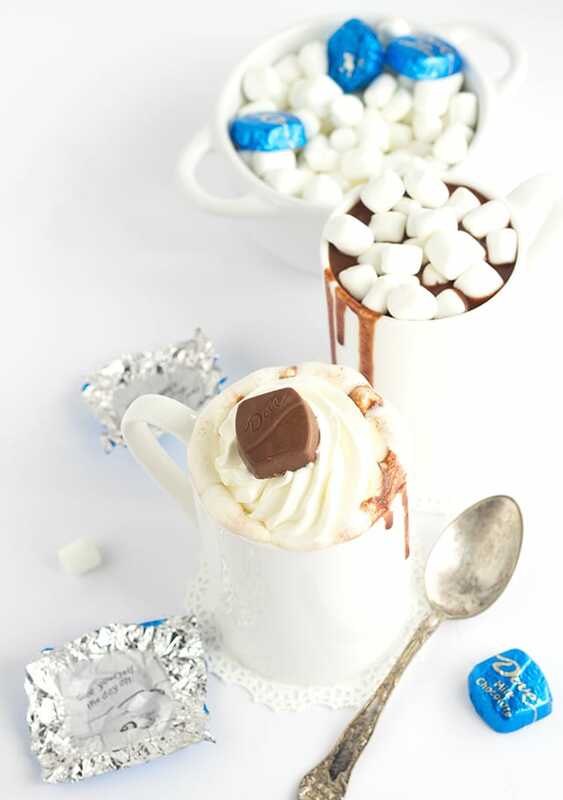 The recipe makes about 4 cups of hot chocolate depending on the size of your cups. If you have a mug like the fox one I have in the photo up above, it’s possible that you may only get 2 or 3 cups full. Those cups can hold sooo much. I love it. Have you tried the mint dark chocolate swirled chocolates? Those are Wesley’s favorite and they are SO pretty. I bet he would go crazy for a mint hot chocolate! Maybe I’ll surprise him with it for our next movie night. I’ll have to save a cup for my chocolate mint crazed son too. The two of them pretty much have the same taste buds. It’s pretty crazy. 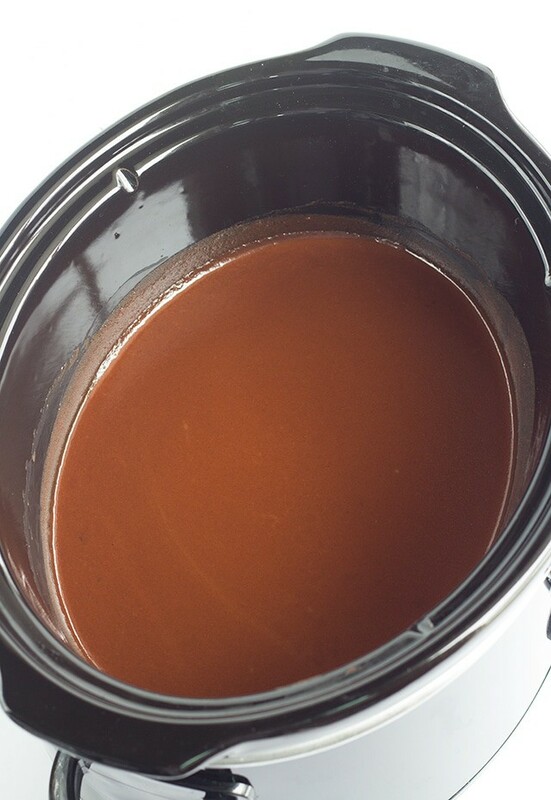 Thick and creamy slow cooker hot chocolate is perfect to throw together! Let it go for 4 hours until extra creamy. Whether you prefer milk chocolate or semi-sweet, you can customize it to your liking! In your slow cooker, add in all of the ingredients. Turn slow cooker on low. Whisk until everything is incorporated. Every 30 - 45 minutes, give the hot chocolate a quick whisk. Make sure to get the curves where the whisk might not reach. Your chocolate will hide in there. After 4 or 5 hours (depending on how thick you want it), remove from the heat. 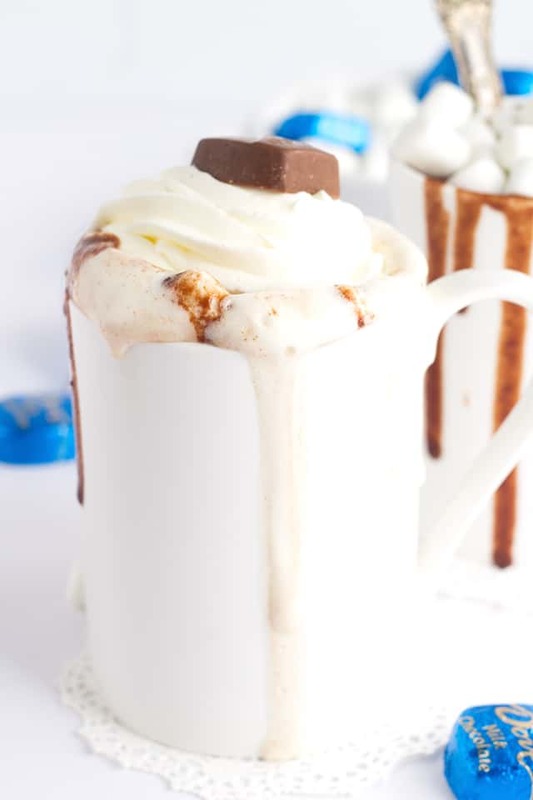 Pour into glasses and top with marshmallows or whipped cream. I used a 1M tip to pipe the whipped cream in my cup. A spoon will work just fine. If you have any hot chocolate left, store in the fridge. You can reheat on warm in the crock pot. It will take several hours to warm completely. Microwaving or heating on the stove top will work perfectly as well. Pro Tip: If you prefer semi-sweet chocolate, use a 12 oz. bag of semi-sweet chocolate chips instead of milk chocolate chips. Have you tried the DOVE® fruit and nut? My son goes bananas for it. Our favorite is strawberry and cocoa almond. It’s strawberry flavored cranberries coated in dark chocolate and cocoa dusted almonds. There are so many other flavors too!